In 1873, Samuel Richardson erected a two-storey frame home on this corner. It survives today, though it has been greatly altered. Richardson added a third floor to his home in 1875, it building in the Second Empire style of architecture, with a Mansard roof and ornate gable windows. When completed, he opened the premises as a hotel, naming it the Richardson House. It also contained a tavern to serve the businessmen of the western part of the city. As Richardson had served for eleven years in foreign lands with the troops of the Thirteenth Hussars, he rarely failed to mention this fact when promoting his establishment. In 1885 a four-storey brick addition was added to the north side of the hotel, on Spadina Avenue, and two years later another extension was added, doubling the number of rooms. The hotel advertised hot-water heating in every room, all for the low rate of $2.00 per day. Weekly boarders received a special rate of $1.50 per day. Samuel Richardson died in 1904. Two year later, it was renamed the Hotel Falconer. Its name was changed again in 1914, when it became Zeigler’s Hotel. In 1916, it became the Spadina Hotel. In the 1950s, the large room on the second floor, on the north side of the hotel, was redecorated and named the Cabana Room. It became a centre for the avant-garde community of the city. Established artists and students from the Ontario College of Art (today the Ontario College of Art and Design University) congregated in the Cabana room to raise a glass to toast their accomplishments or drown their failures. They vilified, praised, defended, and ignored the latest trends in art. Throughout the decades ahead, many of the young artists established themselves in promising careers in galleries, graphic design firms, and commercial art establishments. Others, similar to the old hotel, fell into obscurity. Such is the way of life in the arts community. During the mid-1950s, the first-floor dining room was restored to its 1883 splendour, with Canadian walnut and chestnut panelling. The old doors and the wood panelling remained, but the space was a billiard and games room, much removed from its elegant past. Finally, the glorious old hotel became a hostel for student backpackers. It possessed 185 beds available, with four occupants per room. Because of the building’s brightly coloured walls, ornate gables, and garish trim, it was a landmark in the Spadina district. In 2014, the Backpackers’ Hotel closed and restoration of the buildings commenced, converting it into retail space and offices. The east facade of the Backpackers’ Hotel on Spadina Avenue in 2012. Where the dining room was located in earlier decades. Stairs to the old dining room. The former Backpackers’ Hotel under renovations in April 2015. The restoration work in May, 2015. The spring of 2012 has been exceptional. I attended “Canada Blooms” in March, and although I enjoyed the show immensely, I was very disappointed that they ignored container gardening for terraces and balconies. A sizeable portion of people who attend the show each year live in downtown condos and apartment buildings. Not everyone has the luxury of owning a home with a backyard and front garden. I live in a downtown condo that faces south toward the lake. The 200-foot terrace is on the southeast corner of the building, so is protected from the wind. The pictures below were taken in the spring of 2005. I was born in Toronto. Several years ago we moved downtown and began container gardening. Each year, we maintain a well-stocked herb garden. Container gardening has added to our appreciation of living among the high-rise buildings. The recently published novel, “The Reluctant Virgin,” is a murder/mystery, but it deals with many of the social issues of Toronto during the 1950s. Though the events in the story occurred over a half century ago, they remain relevant today. One of the book’s teenage characters becomes pregnant and another discovers he is gay. However, the most dramatic section of the book is the part that deals with the disastrous effects of teenage bullying. This is an issue that is as important today as it was over fifty yeas ago. Some things do not change. The controversial topics in the book are woven in among the chilling events of the impact of a serial killer who haunts the streets of Toronto. The killer removes substantial qualities of blood from the victims, which baffles the police. As a child, a streetcar ride was an adventure. On our street, only one family owned an automobile, and thus we walked to most places. For destinations more distant, we rode a streetcar. If the streetcar were crowded, my brother and I competed for any remaining window seat. Even today, I enjoy riding the “red rockets” of Toronto. I much prefer them to the subways. In the first decade of the twentieth century, when the open-sided streetcars appeared on routes such as Queen Street, residents of “Toronto the Good” knew that summer had truly unfolded. Avenues were relatively uncongested with vehicle traffic in those days, and it was considered save to hop on and off a streetcar with the sides open to the passing scene and the refreshing breezes of a hot summer’s day. Since only the wealthy owned automobiles, the streetcar was the only means of travel for distances that were too far to walk. However, sometimes families rode the open-sided streetcars simply as an excursion. A trip on the Queen Streetcar to the distant beaches at Woodbine or Kew Beaches were as exciting for children as a modern-day trip to Disneyland. During the 1940s, I remember riding a streetcar such as the one in the picture on the left. It was on Weston Road line, which extended from the Junction area of the city (Dundas and Keele Streets) to Lawrence Avenue West and Weston Road in the town of Weston. As a child, I was excited at the chance to ride the streetcar, particularly as my father had told me that it was an unusual streetcar – it did not turn around when it reached the end of the line. “Of course I saw them,” I replied defensively, feeling that my dad was talking-down to me. “Well,” my dad continued, “he places one pole flat against the roof of the trolley. He then raises the pole at the opposite end of the car and attaches it to the overhead wire. Then he climbs up into the streetcar again. He removes the long handle that operates the controls inside the streetcar, and takes it to the other end of the streetcar, where there is another set of controls. Now he is ready to go in the opposite direction, along the single track that extends the length of the line.” I was amazed. During the late 1940s, we lived near Rogers Road and Oakwood Avenue. Each Sunday we rode the Oakwood streetcar to attend church in the Rowntree District, near Rogers Road and Keele Street. To this day, I remember the wooden benches, the small coal stove for the winter months, and the large windows to observe the passing scene. Of all the streetcars that I remember from my youth, none compares with the famous Peter Witt streetcars of the Yonge Street line. They first arrived in the city in 1921, and remained in service until the subway opened in 1953. The square-shaped streetcars trundled noisily along the roadway on ribbons of steel. Despite the hustle and bustle of the night-time bars and clubs, I remember when Yonge Street was quieter, calmer, and less hurried than today. I was a teenager when they opened the subway. Today, I lament the demise of the old Peter Witt streetcars—“the grand old ladies of the street.” I grow nostalgic as I recall the years I huddled around the cars’ coal stoves on a winter morning, as the streetcars rumbled up the steep hill north of Bloor Street. I recall that as a child, when crossing the intersection at Queen and Yonge, I viewed the busy street, peering north and south, with the bulky streetcars crowding the roadway amid the noisy vehicle traffic. As a youngster I journeyed downtown and glimpsed the marquee lights of Loew’s Downtown, the Imperial, and the Downtown Theatres from the streetcar windows. Even the smaller theatres, such as the Coronet, Biltmore, and Savoy garnered attention with their colourful signs advertising films about adventurers, pirates, gangsters, and gallant soldiers. South of Bloor Street on a wintry evening, I gazed in fascination at Loew’s Uptown Theatre, its flashing marquee lights reflecting on the glass of the streetcar windows. The Yonge streetcars connected me to a world of lights, laughter, and entertainment. My dad had told me that where the streetcar line terminated at Union Station, thousands of immigrants had arrived during the previous decades and passed through its grand hall. The Yonge streetcars had provided their first impression of the vibrant, new-world city that was to be their home. The streetcars had carried men to war when they had departed from Union Station for the battlefields of Europe. At the end of the conflict, when Toronto celebrated, the Yonge streetcars provided the backdrop for the spontaneous parties that erupted on Yonge Street. No other streetcars ever embedded themselves into the soul of Toronto like the Yonge streetcars. They were the streetcars that delivered children to places of adventure—Eaton’s Toyland, the Yonge Arcade, movie theatres, and toyshops. Subways are faster if a person wishes to simply travel from point A to B in the least time possible. Few refute this argument. However, I firmly believe that the day of the subway is ending. They are too costly and take too long to build. In countries with large populations and small geographic size (e.g. England, France, Spain ), and in cities that are compact and where the federal government is contributing to their financing, then subways may remain viable for another decade. For everywhere else, they are too costly and too take too long to build. The way of the future is “light-rapid transit,” which is not to be confused with streetcars on their own right-of-way (Spadina and St. Clair streetcars). The LRT system is San Francisco is an excellent example. The LRT trains are about a third the size of those on a subway, and thus the stations cost much less. Trains are more frequent to compensate for the smaller-size trains. Unlike streetcars, the distance between stations is similar to subways, which reduces the time required to travel the length of the line. Where the city traffic is highly congested, the trains travel underground, and in in less congested areas, they travel above ground on their own right-of-way. This is the same as the LRL proposed for Eglinton Avenue. An LRT is the best of both worlds. They are almost as speedy as a subway, with reduced construction times and far less costs. It’s fine for Mayor Ford to rant against construction of LRTs. He won’t be a passenger in either a subway or a LRT, as he’ll be in a comfy automobiles, likely subsidized by taxpayers as a business expense. I suppose it’s unkind to say that he will be riding his own “gravy train.” Some politicians say that if the city builds an LRT, it will have to be replaced in 30 years with a subway. Nothing wrong with this. If passenger traffic merits a subway on that route 30 years from now, then a subway is merited. In the meantime, where passenger loads are too light for a subway, such as on Finch and Shepherd, should we wait 30 years for a proper transportation system? 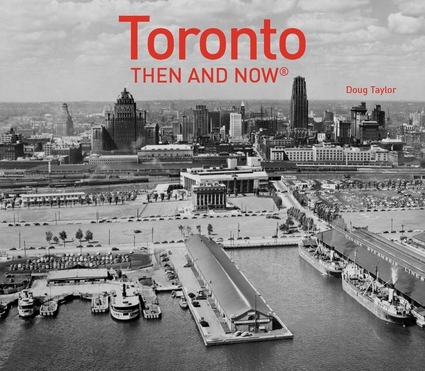 “The Toronto Trilogy” chronicles the life of the city through the 1940s, 1950s, and 1960s. Historical fiction is perhaps one of the best venues for exploring the past, as the daily lives of individual characters is the true story of any decade. The book that precedes the trilogy is entitled, “There Never Was a Better Time.” It is a tale of the adventures of two young men who immigrate to Toronto in the 1920s. Sinful vaudeville and the “talkies” become the weekly haunts of the two men as they enjoy the diverse pleasures that Toronto offers. They chase the women at Sunnyside Beach, the Toronto Islands, and even pick up girls in the Food Building at the CNE. Is a glorious tale of youthful adventure. The main characters of the story fall in love in a vibrant city that they have learned to adore. The book allows readers to experience the “Roaring Twenties” in Toronto and gain insight into the personal joys and sorrows of those who immigrated from other countries or small towns to the the big city, during one of the most exciting times of the 20th century. The book contains many archival photographs that help bring realism to a fictional tale. The first book of “The Toronto Trilogy” is entitled “Arse Over Teakettle.” It tells of a family’s struggles with the stress of the war years in Toronto during the 1940s. The story centres around a young boy named Tom Hudson, yearning to come-of-age as his family and adult neighbours cope with the horrors that war inflicts. The book provides detailed insight into life in Toronto during the 1940s, and tells of Tom attending school in this tumultuous decade. Many of the tales are humorous and heart-warming. When a mischievous boy Tom’s age moves into the neighbourhood, the story become considerably livelier. The lads nick-name the new-comer “Shorty,” and he leads his mates in a merry chase as he explores the activities of “the big boys,” which of course includes their sexuality. The social prejudices and moral issues of the decade are exposed as the story progresses. Tom is forced to examine these attitudes, as he gazes into the complex world of adult values. The title of the book, “Arse over Teakettle” is derived from an old English expression, “He/she fell arse over teakettle,” meaning that the person “fell head over heels.” At some point, every assumed value and understanding that the characters believe is turned “upside down,” or as the book expresses it, “Arse Over Teakettle.” This is as true for the adults in the story as it is for the children. The second book of “The Toronto Trilogy” is entitled “The Reluctant Virgin.” It continues where the first book left off, chronicling the lives of Tom and his outrageous friend Shorty as they mature as teenagers in the 1950s. However, the gentle nature of the first book, which is a tale of human relations and childhood adventures, becomes brutal as this book is a murder/mystery. On the Labour Day weekend, a young female teacher at the high school where the boys are to attend when school opens in September, is murdered in the seclusion of the Humber Valley. This is a graphic tale of a serial killer who haunts the streets, ravines, and laneways of Toronto. The killer disguises the methods employed to dispatch the victims, and the police are not aware they they are seeking a serial killer. To add to the mystery, the killer drains copious amount of blood from the victims. This book is not intended for readers who shy away from graphic details of a murder or the rough language of earthy characters. Similar to the first book in the trilogy, the novel exposes the social prejudices and moral dilemmas of the decade. The third book of “The Toronto Trilogy,” entitled “A Virgin No More,” will be available next year. The story tells about the lives of the same characters as the first two book, as they proceed into the decadent decade of the 1960s. I have spent much of professional life studying and teaching about Toronto’s past. My book “The Villages Within,” which is non-fiction, was short-listed for the Toronto Heritage Awards. The city has a rich and diverse history, appreciated by a few and ignored by many. This is a pity. To entice readers to learn more about the city, my recent books attempt to present the historical facts woven into entertaining stories. Historical fiction is perhaps one of the best venues for relating tales of the past, as the human drama of daily life is the true story of any decade. The books are presented chronologically.The first book is entitled, “There Never Was a Better Time.” Is a tale that relates the adventures of two young men who immigrate to Toronto in the 1920s. This was one of of the most interesting and lively periods in the city’s history. Sinful vaudeville and the “talkies” become their weekly haunts as they enjoy the diverse pleasures that Toronto offers. They chase the women at Sunnyside Beach, the Toronto Islands, and even pick up girls in the Food Building at the CNE. Is a glorious tale of youthful adventure. The main characters of the story fall in love with the city and its entertainment venues. The book allows readers to learn about the “Roaring Twenties” in Toronto while gaining insight into the personal joys and sorrows of those who immigrated from other countries or small towns to the the big city, during one of the most exciting decades of the 20th century history. The book contains many archival photographs that help bring realism to a fictional tale. After completing this book, I began writing the first book of “The Toronto Trilogy.” It is entitled “Arse Over Teakettle,” and tells of a family’s struggles with the stress of the war years in Toronto during the 1940s. The story centres around a young boy named Tom Hudson, as he watches his family and neighbours cope with the horrors that war inflicts. The book provides detailed insight into what it was like live in Toronto during the 1940s and for a child to attend school in this tumultuous decade. Many of the tales are humorous and heart-warming. When a mischievous boy Tom’s age moves into the neighbourhood, things become considerably livelier. The boys nick-name the new-comer “Shorty,” and he leads his mates in a merry chase as he explores the activities of “the big boys,” which of course includes their sexuality. The social prejudices and moral issues of the decade are exposed as the story progresses. Tom is forced to examine these attitudes, being a child gazing into the complex world of adult values. The title of the book, “Arse over Teakettle” is derived from an old English expression, “He fell arse over teakettle,” meaning that the person “fell head over heels.” At some point, every assumed value and understanding that the characters believe in is turned “upside down,” or as the book expresses it, “Arse Over Teakettle.” This is as true for the adults in the story as it is for the children. The second book of “The Toronto Trilogy” is entitled “The Reluctant Virgin.” It continues where the first book left off, chronicling the lives of Tom and his outrageous friend Shorty as they mature as teenagers in the 1950s. However, the gentle nature of the first book, which is a tale of human relations and childhood adventures, becomes brutal as this book is a murder/mystery. One of the young female teachers of the high school where the boys are to attend, is murdered in the seclusion of the Humber Valley. This is a graphic tale of a serial killer who haunts the streets, ravines, and laneways of Toronto. The killer disguises the methods employed to dispatch the victims, and the police are not aware they they are seeking a serial killer. To add to the mystery, the killer drains copious amount of blood from the victims.